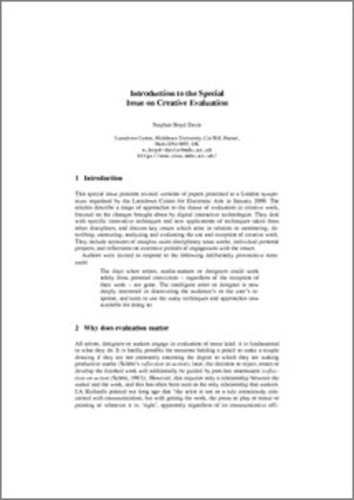 Introduction to the special issue on creative evaluation. This special issue presents revised versions of papers presented at a London symposium organised by the Lansdown Centre for Electronic Arts in January 2009. The articles describe a range of approaches to the theme of evaluation in creative work, focused on the changes brought about by digital interactive technologies. They deal with specific innovative techniques and new applications of techniques taken from other disciplines, and discuss key issues which arise in relation to monitoring, describing, measuring, analysing and evaluating the use and reception of creative work. They include accounts of complex multi-disciplinary team works, individual personal projects, and reflections on extensive periods of engagement with the issues. Dr. Boyd Davis devised and chaired the peer-reviewed symposium 'Completing the Circle' at the British Computer Society, London, 19 January 2009. 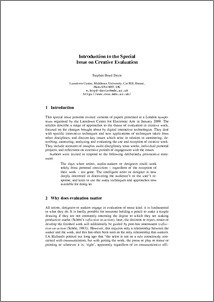 This led to the Special Issue of Digital Creativity to which this article is the introduction.